Milbrandt Vineyards are concentrated in the Wahluke Slope (AVA established in 2006) and the Ancient Lakes of the Columbia Valley (AVA established in 2012 with the help of Butch and Jerry). The high elevation (up to 1,475ft) and shallow soils of the Columbia Valley make it an unassuming and distinctly beautiful place to grow grapes. Both growing areas share the same low rainfall and long sunny days during the growing season, yet each area has very distinct terroir. 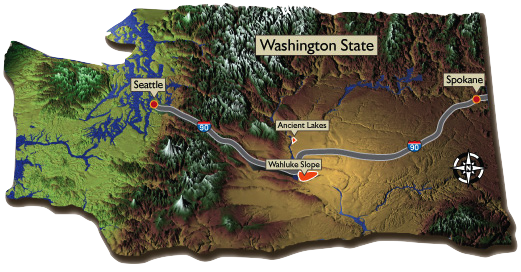 Wahluke Slope is especially ideal for red wines and Ancient Lakes for white wines. Butch and Jerry were careful about matching the right variety to the right site. Known as some of the best growers in the state, Butch and Jerry’s fruit is amongst the most sought after in Washington.